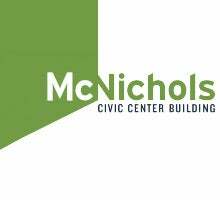 The McNichols Building makes every effort to offer a wonderful experience for our guests with limited mobility. Parking for vehicles displaying proper identification is available in the accessible parking meters located directly west of the main entrance. There is also a loading zone in the front of the building capable of serving as a drop off point for visitors. Additional nearby parking spaces are available at the Sheraton and Denver Post buildings located just north of the McNichols Building. Accessible seating varies from one event to the next. Access to the building is obtained through the two accessible ramps in front of the building. There are three floors in the building which are all accessible by the passenger and freight elevators. All restrooms as well as drinking fountains are accessible. Please call in advance for more information. We are committed to ensuring that our website is accessible to everyone. Our website policy states that its web pages will comply with WCAG 2.0 AA, published by the World Wide Web Consortium (W3C), Web Accessibility Initiative (WAI), available at www.w3.org/TR/WCAG.